Konstantinos Tsanas has had a terrible summer since moving to Germany from Athens in April. But apart from the depressingly wet north European weather, he says he is happy in a country cursed by many Greek politicians because of its insistence on tying financial aid to strict austerity. “Ignore the politicians – Greeks and Germans get along, I feel at home here,” he says of Essen, the industrial city on the Ruhr in north-west Germany that he has chosen as his new home. Here his wife, who speaks German, quickly landed the kind of office job she had been unable to find in Athens. 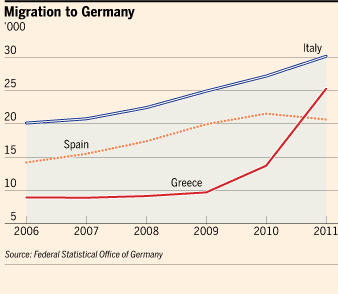 That hope is making Germany home to a growing number of Greeks. Some 25,300 of them came last year, according to the German statistical office, with the net number of “German Greeks” rising by 14,000 to just under 400,000 – a significant jump after a net outflow in the preceding years.